Last Saturday I went for my first flight in Stephen’s Found Aircraft Bush Hawk – what a great experience! You may recall from a previous post that this Bush Hawk arrived in Australia from Alaska in November last year. 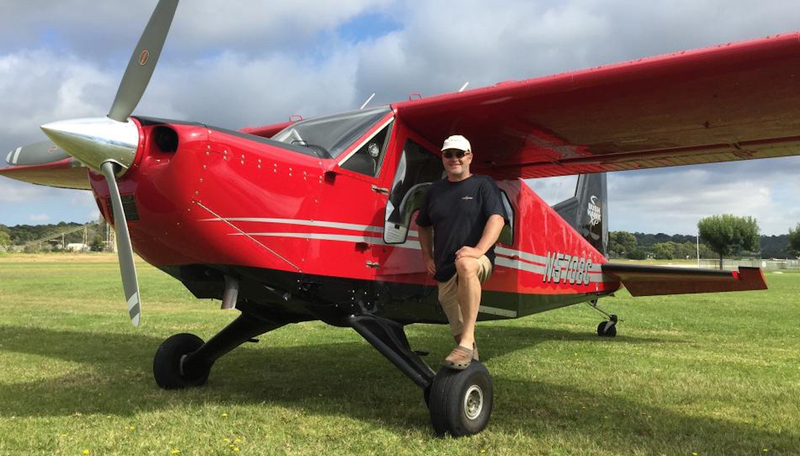 Since then, Stephen has been flying it to gain his RPL and get used to an aircraft that is very, very different from the Carbon Cubs he flies and sells in Australia. Buckling in, there’s a 5-point harness (is this plane aerobatic? Surely not) with inertia-reel shoulder straps. The door closes with a satisfying clunk and if you want a really tight seal, you can optionally operate the corner latches to secure it. One interesting aspect of this aircraft is that there are also two rear doors to access the cavernous rear cargo/seating area, which although currently fitted with three rear passenger seats, still leaves a baggage area behind them which is bigger than many estate wagons! Inside, the noise is subdued – in part due to the excellent Bose ANR headsets. Outside, I know the aircraft is making quite a noise, a characteristic of a propeller running full speed at fine pitch. Climb out is not particularly steep but the forward speed contributes to a rate of climb well over 1,000 fpm. All too soon, we are round the island and Stephen takes over for the approach and landing. I am told this aircraft drops like a stone when you take off the power and add flap. If so, it doesn’t feel like it – Stephen’s many hours of practice have smoothed out all the lumpy bits. We turn on to final at around 70 knots, reducing just a little to 65 on short final. The landing felt great to me but Stephen’s a bit of a perfectionist and felt he arrived a bit to soon. But there was no bounce and the aircraft settled nicely on the grass. You can see the video I made of the approach by clicking the picture below. Overall, I enjoyed this short flight; the Bush Hawk seems easy to fly – at least on this no-wind, smooth-air day. It feels and sounds a bit like a big luxurious truck, with its long nose and 6-cylinder engine beat. The fuel burn took my breath away but if you want an aircraft like this, low fuel consumption is not too near the top of your priority list. However, the Bush Hawk will carry up to 5 people and their baggage, in relative comfort, into and out of bush strips. It has a relaxed cruise in the 115-125 knot range, so you can get to those far-away places reasonably quickly. Which is exactly what it was designed to do. It’s a shame that Found Aircraft could not make their business work – they certainly deserved a better destiny after designing and building this superb aircraft. 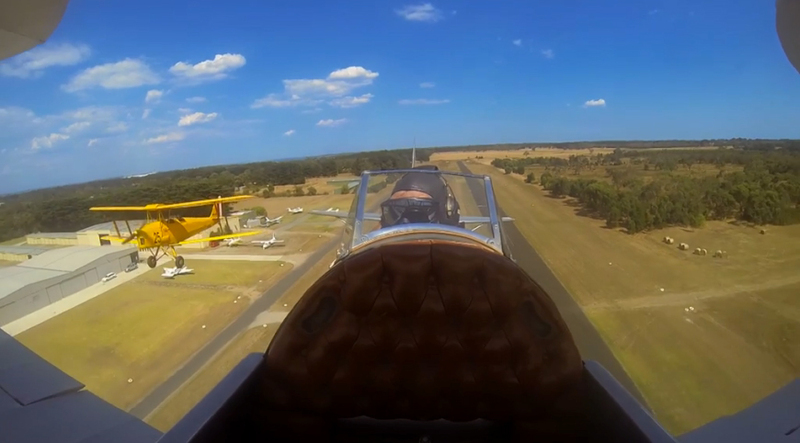 On Sunday 28 December I enjoyed a few circuits at Tyabb Airport and a local flight around the Mornington Peninsula in the Interstate S-1A Cadet. The weather was very good early on with quite smooth conditions and a light south east wind. There’s always a cross-wind on the north-south strip at Tyabb. I made a short YouTube video of the take-offs & landings in the Interstate which you can see by clicking here or on the photo above. I suppose I must have completed 50-75 landings in this aircraft now, so things are feeling easier, although with a tail dragger you always need to keep on your toes – literally and metaphorically! While I was circuit-bashing, my friends Stephen and Mike flew in Stephen’s newly acquired Bush Hawk down and around Wilson’s Promontory, the most southerly tip of mainland Australia. It’s about an hour and a half round trip from Tyabb in that aircraft. They reported good conditions, although there was a little lee-turbulence at lower levels around the ‘Prom’. I think Stephen gets nosebleeds if he flies higher than 500 feet… Up higher, there was quite a stiff northerly, which slowed them a bit on the return journey. But back to the Interstate. I have now completed just over 30 hours flying in the aircraft since the first flight early in August 2014. As a result, it’s starting to feel more relaxed to take-off and land. Admittedly I haven’t thrashed it, but fuel consumption is working out at a very economical 20 litres (just over 5 US gallons) an hour and it hasn’t used any oil so far; although there’s always a drip or two on the hangar floor after each flight. The camera I used was the Garmin VIRB, a competitor to the now almost inevitable GoPro. The Garmin is a completely different shape and can be controlled via an App installed on an iPhone, iPad or other smart device. Unlike the GoPro, the Garmin view finder is built-into the camera and is on the top (or bottom, if the camera’s mounted upside down) not on the back. The Garmin also comes with a very easy to install neutral density filter to help get rid of those peculiar ‘feather’ effects you often see on videos taken through a rotating propeller. It’s the first time I have used it – in the past, I have relied on my trusty old GoPro – so it’s interesting to compare. Maybe, if I can find the time, I’ll do a bit more of a comparison in a different blog post. Hopefully, there will be more Interstate videos coming soon. Over the next few months, Tyabb Airport will be undergoing some significant works to repair and improve the main apron, taxi-ways, drainage and runway lighting. Money for these works was granted through the regional airports development fund – other airports near to Melbourne which have also benefitted significantly from the development fund include Coldstream and Lethbridge. The airport is also home to a number of other aviation related industries, including service and maintenance facilities, as well as to Cubcrafters Australia, agents for the Carbon Cub, and of course to Foxbat Australia! Of particular interest is The Old Aeroplane Company (this is a link to very nice current video), which is based on the western side of the airport. Owned and operated by Judy Pay, The Old Aeroplane Company not only restores and services older aircraft (as well as new ones), it also houses a unique collection of warbirds and other interesting aircraft – here’s a link to a Flickr gallery of some of them: Old Aeroplane Company pictures . You can visit – but phone to check first to ensure they are open: 03 5977 3355. Here’s another article and pictures about the recovery and restoration of a Curtiss P-40F Warhawk, one of the gems of the Old Aeroplane collection. For those who want to fly in, Tyabb Airport is one of the few regional airports offering both Avgas and 98 Octane Mogas at the bowser. Daily and overnight parking is available. If you’re visiting come over and visit Foxbat and Cubcrafters at Hangar 11 – the first hangar due south of the PAC club house.